Flexibility. It’s a topic that can be more polarizing than most people realize. On one end of the spectrum, we have the double jointed people or people who can effortlessly do the splits, but who are more prone to sports injuries. On the other end of the spectrum, you have people who are in pain if they try to reach past their knees and who feel incredibly frustrated if they attend a yoga class. There are others who have limited range of motion due to aging or an injury, and this makes everyday living more difficult. Most people fall somewhere in the middle. But why does it matter, and how can you improve your flexibility if you’re stiff and inelastic? If you’re not very flexible, but it’s not bad enough for you to notice it or have any interference with your daily life, is it worth pursuing a more limber frame? We say yes, for several reasons. Anyone who has suffered from limited range of motion knows that it is no fun. In essence, it’s painful or impossible to move your body in a normal way. Flexibility exercises are a way to reduce stiffness, swelling, and inflammation and keep your body moving so that you can have the best quality of life. Moving your body the right way is important whether you’re an athlete looking for peak performance or someone who sits at a desk for eight hours a day. The more flexibility you maintain, the more likely it is that your body will move smoothly and effortlessly. If you’re not flexible enough, you could end up using methods to compensate for the motion you’re trying to achieve, and this could hurt your back or otherwise injure you. Did you used to be able to move your body in ways that are simply impossible now? Aging tends to make people less flexible, and unless you’re being intentional about flexibility exercises, you can expect that stiffness to increase. Lack of flexibility is why many older people have difficulty with movement and balance, and we don’t want that to be you! Here at Every Body Balance, we’re all about helping with flexibility. The good news is, there is no such thing as “too late” when it comes to developing a more flexible, limber body. 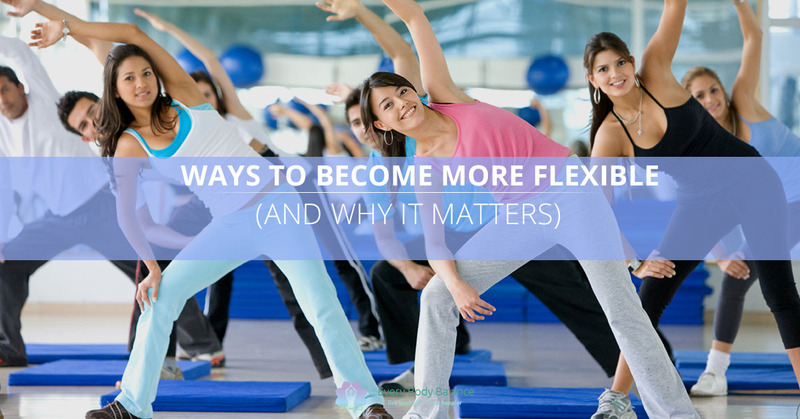 What’s even better news is that there are so many ways to work on your flexibility, it’s probably already on the program for your favorite workout. Here are some of the classes we offer that will work on your flexibility. Pilates training is known for its ability to strengthen your core muscles, increase your flexibility, and improve your overall performance. More and more top athletes are turning to Pilates because of its powerful effect. If you’re just looking for flexibility training, you’ll come away with a ton of other benefits, too, like a flat stomach. It’s no surprise that Barre classes are a great way to develop more flexibility. Have you shied away from barre because you didn’t think you could do so much as get your foot waist-high? Don’t hold back! Everyone in the class had to start somewhere, and you’ll be amazed at the progress you can make with our instructors’ help. Yoga is probably the first thing that comes to mind when you think of flexibility. However, if you’re not flexible, it may also be a class you stay away from because you don’t think you’re cut out for it. Never fear. Attending a yoga class doesn’t mean that you have to instantly transform yourself into a human pretzel. The great thing about yoga is that it’s gentle. In slow steps, you’ll acquire the flexibility you need. At our core fitness classes, you’ll get toned, conditioned core muscles while also burning fat! However, that doesn’t mean that you won’t get flexible, too. Flexibility moves are built into our workouts to ensure that you’re strong and limber. You didn’t think we’d leave out a crucial element like flexibility in our boot camp workouts, did you? While you might think of boot camp as a way to go outside and sweat with other people, we don’t skimp on your stretches. So if boot camp is more your style, come and let us help you with flexibility there! When you sign up for one of our classes, we’ll work on all aspects of your fitness, including flexibility. Come and find out what it’s all about!